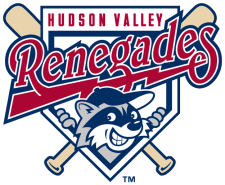 The Hudson Valley Renegades were hammered by the Brooklyn Cyclone by the score of 16-5 on Thursday night. Brooklyn jumped out to a three run lead in the first inning. Darrell Ceciliani and Cory Vaughn singled back to back to put runners on. Jeff Flagg followed with a triple to center, scoring both runners. Flagg would then score on a single by William Cherry to give them a 3-0 lead. Brooklyn posted another run in the fourth. Joe Bonfe singled to third, then advanced all the way to third base on a throwing error. Bonfe would then score on a ground ball by James Schroeder to increase the lead to 4-0. The Cyclones offense struck again in the fifth and this time it was another two run triple by Flagg. The additional runs gave them a commanding 6-0 lead. The Renegades finally reached the scoreboard in the sixth inning. Derek Dietrich reached on a force out, then advanced to third on a double by Nicholas Schwaner. Steven Tinoco then reached on an error, scoring Dietrich and Schwaner. Elias Otero drove home Tinoco with a double to left, cutting the lead in half 6-3. But Brooklyn countered with three runs of their own in the bottom of the sixth. A three run homer by Rylan Sandoval erased the three run inning by the Renegades and increased the lead to 9-3. The Cyclones put the game out of reach in the seventh inning, striking for six runs in the inning. Five hits with four of them for extra bases combined with two walks and two errors help fuel the big inning for the Cyclones that put them out in front by the score of 15-3. Brooklyn added one more run to their total in the eighth inning. Juan Centeno doubled to left to score Joe Bonfe and push the score up to 16-3. The Renegades added two more runs in the ninth. Schwaner delivered a two run homer that gave them their final two runs of the game as they took the 16-5 loss. Joey Dettrich suffered the loss, allowing 6 runs (5 earned) on 8 hits in 4 innings. Kevin Chavez was hit the hardest, surrendered 8 runs on 9 hits with a strikeout and a walk in 2 2/3 inning. Adam Liberatore gave up two unearned runs on 2 hits with a strikeout and 2 walks in 2/3 inning. Nate Garcia was hitless for 2/3 inning striking out 1 in the process. The series moved back to Dutchess Stadium for the final game on Friday night. Kyle Ayers (0-0, 2.45) will be on the mound for Hudson Valley facing Brandon Sage (0-0, -.--) for Brooklyn.